Montpellier mounted a superb fightback and then held off a late surge from Glasgow Warriors to come away from Scotstoun with a 29-22 European Champions Cup victory. Both sides came into Friday's meeting having lost their opening two matches of the campaign, but Montpellier's four tries secured a maximum return and moved them level with second-placed Exeter Chiefs on eight points in Pool 3. The Warriors, meanwhile, at least got off the mark with a consolation bonus point but the runaway Pro14 leaders will have expected a whole lot more after taking a 17-5 lead inside half an hour. Following Finn Russell's early penalty, Montpellier claimed the first try as Aaron Cruden fed Kelian Galletier to go over in the corner. But the Warriors took what appeared to be a commanding lead as Leonardo Sarto showed neat footwork to cross and George Turner extended the advantage thanks to Russell's excellent pass. Turner undid some of that good work by seeing yellow for an off-the-ball tackle and Montpellier capitalised on their numerical superiority as Galletier embarked on a stunning break to touch down. The visitors were two points ahead at the interval after being awarded a penalty try when Jonny Gray was sin-binned for bringing down a rolling maul and that lead was stretched early in the second period through Jacques Du Plessis. 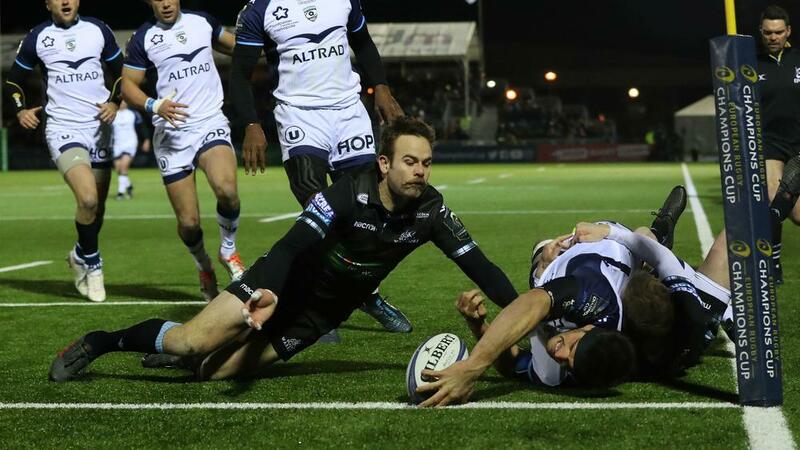 Sarto's second, following Russell's chip and Huw Jones' run and offload, got Glasgow back in it but Francois Steyn slotted a penalty and in the remaining 10 minutes Montpellier survived fierce pressure to prevail.